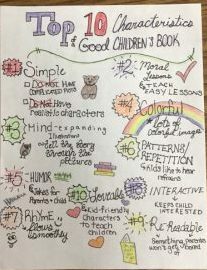 Utilizing the SKETCHNOTES technique that I featured in a previous post, I have students begin by creating a notes page titled, “Top Ten Characteristics of a Good Children’s Book”. 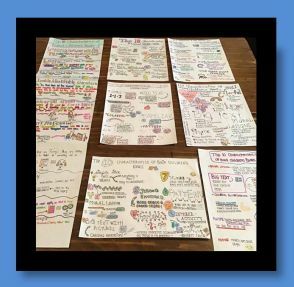 I go over the SKETCHNOTES concept and show them some samples of other classes work so they get an idea of what this can look like. I stress that I’m not grading on artistic ability. Notes, however, should be neat, reflect personal style and follow the criteria on the guide sheet! Once I’ve gone over the basic info, I provide students links to articles that they must pull their notes from. They must utilize all resources, but include the ten they think are most important. See guide sheet below for specific criteria along with some awesome examples. The articles I use are as follows: Four Characteristics of a Good Children’s Book, What Makes a Good Children’s Book? 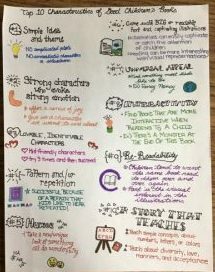 and Nine Factors that Make a Children’s Book Successful. Since I have the I Am Your Child Series, I do show my students the “Ready to Learn” DVD with Jamie Lee Curtis and LeVar Burton. 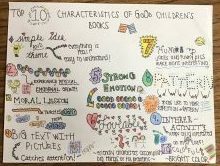 Students then utilize their SKETCHNOTES as they read and evaluate 3 different children’s books. I set up a whole table full of children’s books. Students choose 3 books that vary in author and theme to evaluate. 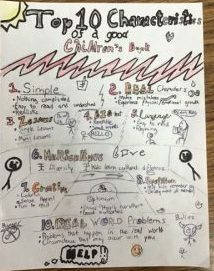 Students add their criteria to the top portion of the grid on their evaluation paper along with the book titles and author’s names. Then, students read through each book and mark the characteristics present in each book. This part of the assignment is fun to listen to class comments/conversations as many reminisce about where and when they read them as youngsters! From there, they must answer specific questions about each book. 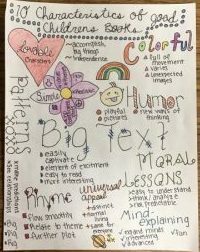 They must provide brief summaries, the age-range they feel the book is recommended for, how they can involve the child, suggest an activity that not only extends the book, but also incorporates the PIES and finally list themes within the book. To help students determine the age-range the books are recommended for, I provide them with a guide sheet from our local library that gives some characteristics for each age level. Finally, after students have read/evaluated three books, they must choose one to respond to in the writing prompt. After they write their response, we do a peer review/annotated edit. Students then have the opportunity to make corrections for a better grade. This helps promote/reinforce their writing skills for the state test. If you don’t have to include these core concepts in your lessons, then simply ignore this step.